A week ago, the Orange-and-Blacks claimed a 2-1 come-from-behind victory at Stal (the Donetsk side responded to Kuzyka’s opener with goals from Taison and Blanco Leschuk). Fred came back into Shakhtar starting XI, who stressed after the match that fans would be able to see his best performance in the near future. Following three rounds, Paulo Fonseca’s men are coming second in the Premier League table. The outfit is gearing up for the encounter against Mariupol at the Sviatoshyn base. Ivan Ordets trains individually, as Maksym Malyshev is certain to miss out the game through the injury. Mariupol returned to the Premier League after relegation at the end of the 2014/15 season. Then the Azov-based side played home games away to finish at the bottom of the top flight, having gained only 14 points. Oleksandr Sevidov took charge of the squad since last summer. Under his management, Mariupol confidently went through the 2016/17 season campaign in Ukraninian First League, holding the top spot of the table until the end of the season. The top scorer of the team was Ruslan Kysil (17 goals). Mariupol have not yet known the bitterness of defeat in the top division. Following a draw against Veres, the Donbas team gained another point in the duel against Zorya (1-1), and secured a 3-0 win at Chornomorets last weekend (courtesy of Sergii Vakulenko’s brace and a strike from Ruslan Fomin). The counterparts hold 34 face-to-face fixtures in total. Shakhtar have 31 wins under their belt, with 3 other games ending in a draw. The goal difference is 89-23. 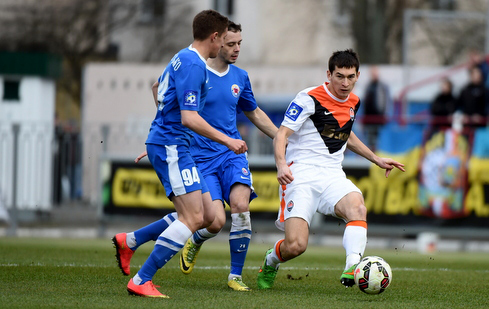 The Donetsk squad emerged victorious 16 times home, being held to a draw only once. The goal difference is 47-10. On April 5, 2015, Mircea Lucescu and Mykola Pavlov held their last matches at the helm of Shakhtar and Ilichyvets respectively. The rivals registered the most productive match in the entire history of head-to-head meetings with the score of 6-2 in favour of the Orange-and-Blacks. By the middle of the first half, the Miners were 2-0 up thanks to Gladkyi’s strike and an own goal from the Azov team defender Zubkov. Then Sergii Shevchuk overturned the deficit, but Marlos and Teixeira extended the lead even before the break. In the second half, Grin sent his shot home to make it 2-4. However, the Donetsk team did not only lose their advantage, but only strengthened it, with Teixeira and Nem completing the scoring. Taison can make his 170th appearance for Shakhtar, as Fred may make his 120th. The Miners scored 4,599 goals in competitive matches during their entire history. Be the first to learn the match line-ups by signing up to Telegram and Viber accounts of FC Shakhtar.